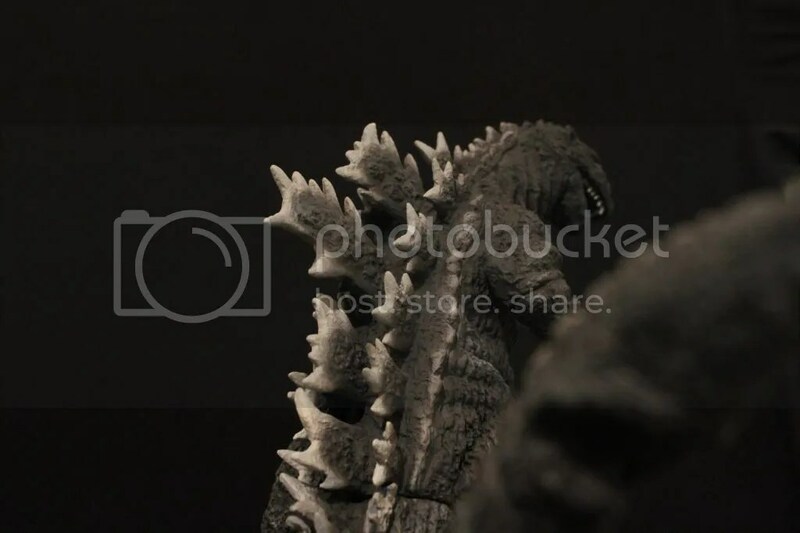 X-Plus 25cm Godzilla 1955 | Fresh Vinyl HQ! 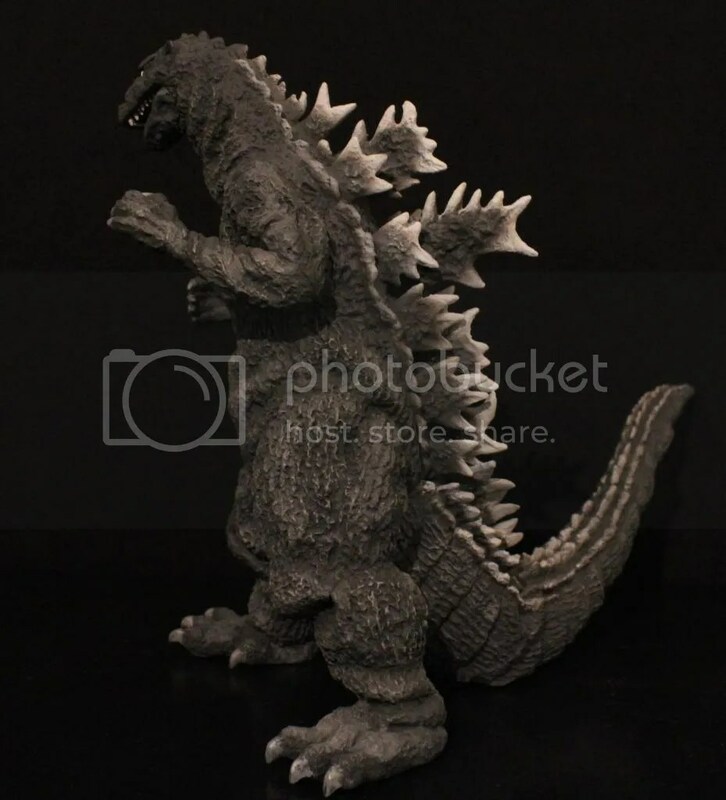 The X-Plus 25cm Godzilla 1955 was released in May 2011. 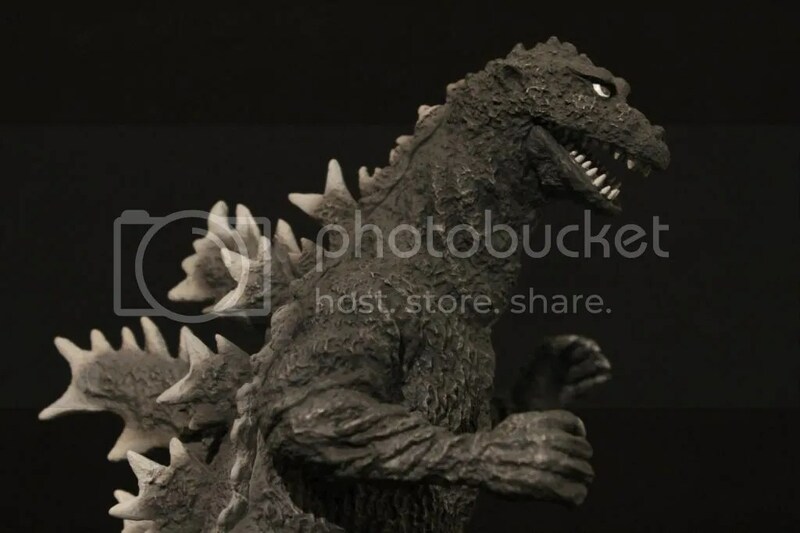 It is stylized in black and white to capture the look of the 1955 film, Godzilla’s Counter Attack, or better known as Gigantis, the Fire Monster or even better known as Godzilla Raids Again. 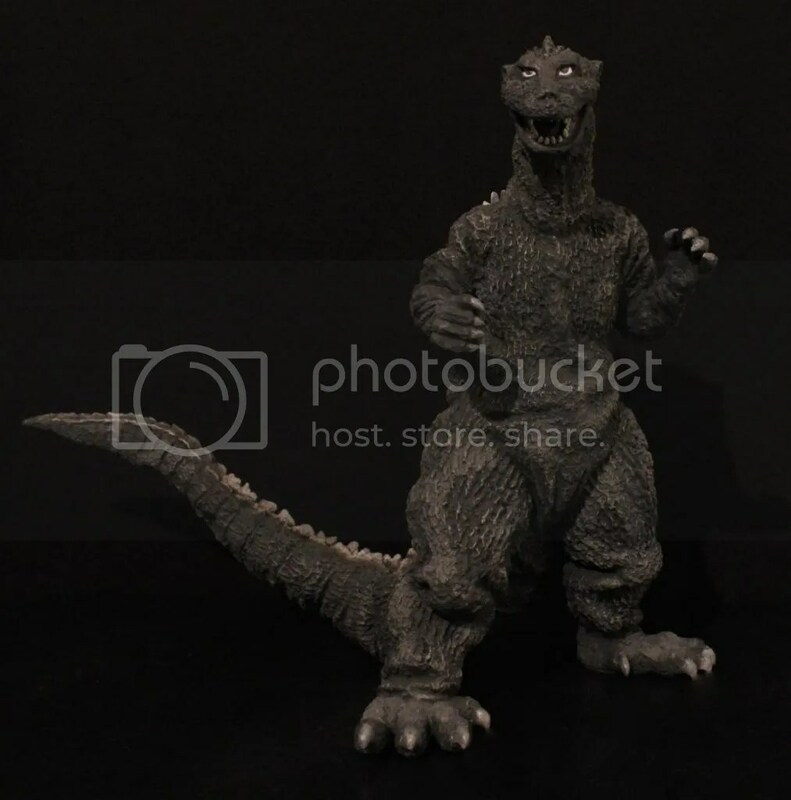 This figure is definitely one of the rarer figures in the whole 25cm line up. Sculpt and detail are FRESH. 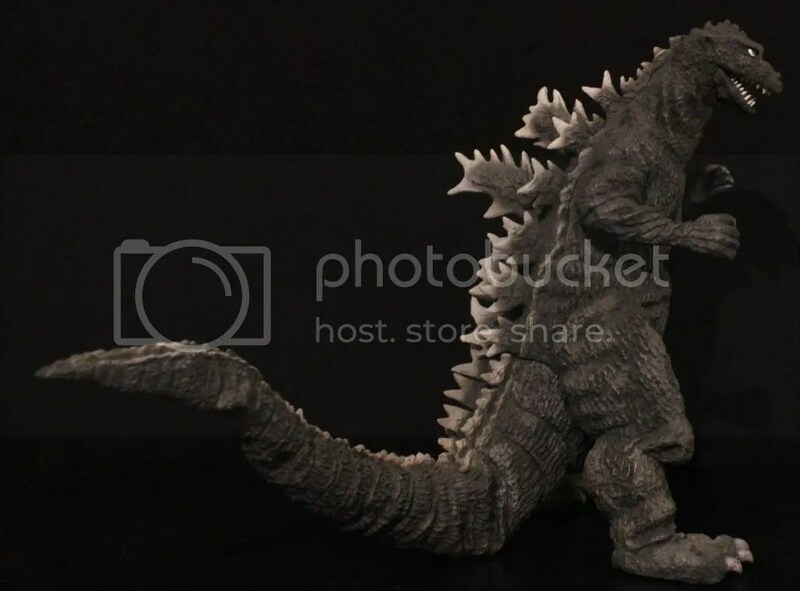 The pose is light years better than the boxing pose of the 30cm G’55. All in all it is a great figure! 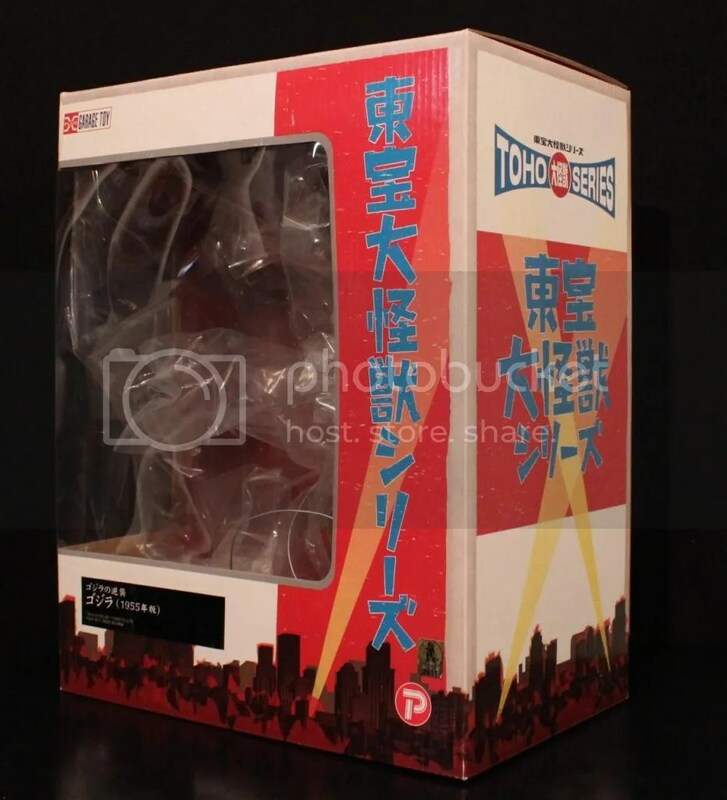 The box for Godzilla ’55 is your typical X-Plus box. Nothing special here. 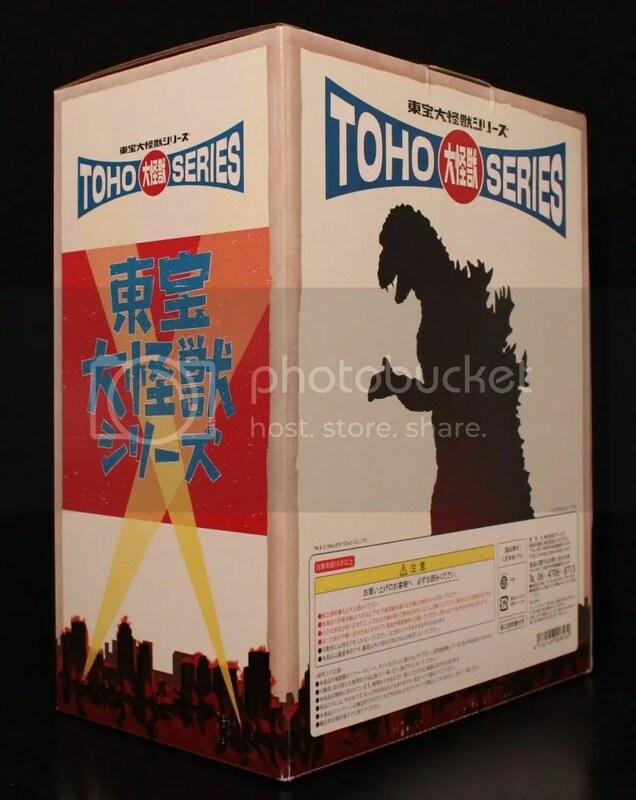 Basic red and white box with Toho Large Monster Series marked about the box. Basic window display that is found common on almost all standard size 25cm figures. 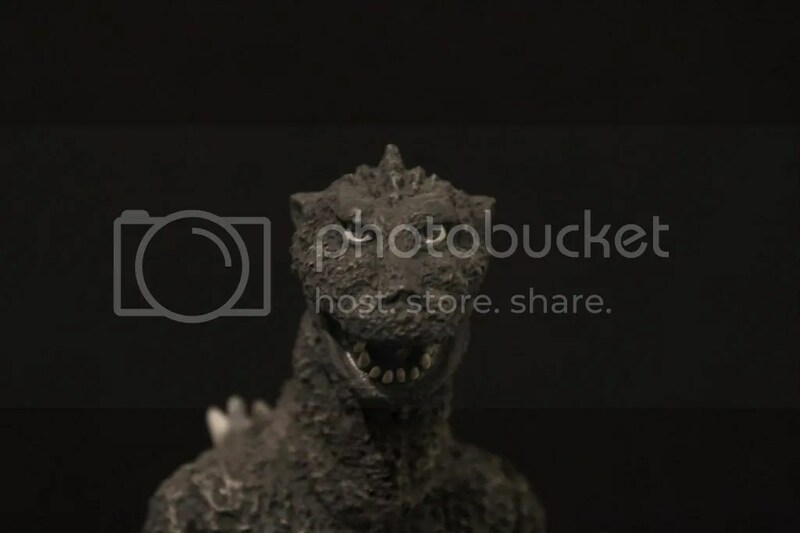 The black label at the bottom is a sticker that is placed on and printed with Godzilla 1955’s corresponding information. The detail throughout the figure is very well done. As always, X-Plus made this figure perfectly. It looks like it you pulled it right out of your TV screen. Yea, pretty much like every other X-Plus figure. Even painted in black and white tones, the paint job is superb. X-Plus always does a great job at shading and fading. 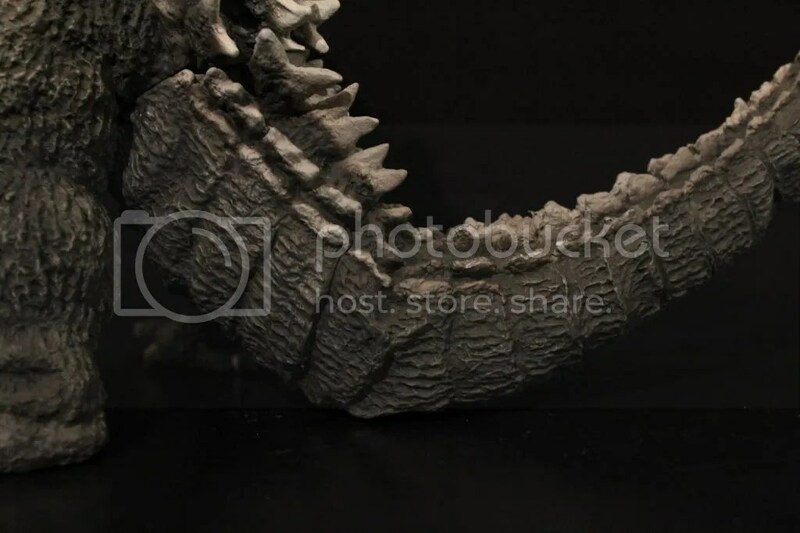 The dorsal plates here a prime example of the great work that X-Plus does. On top of the paint job, the sculpt is done really well. I love how the bagginess of the suit is captured. The legs, tail, neck and arms all show signs of bagginess. 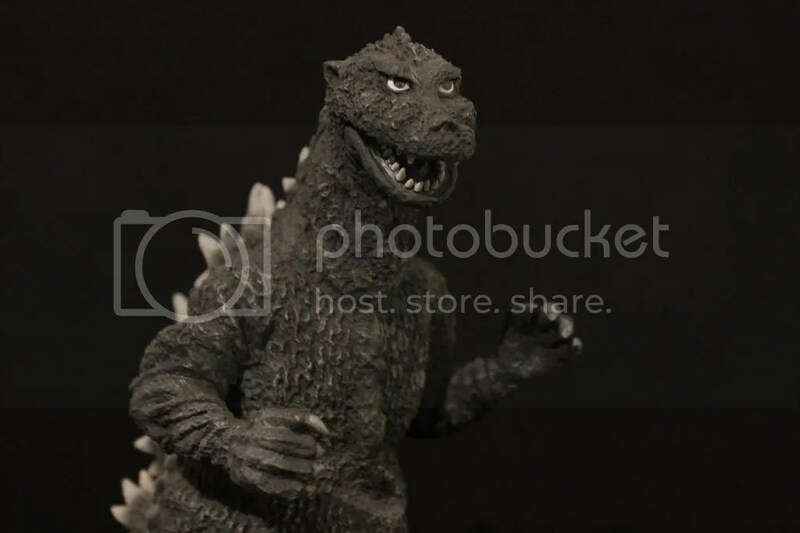 Godzilla’s face is perfectly captured. 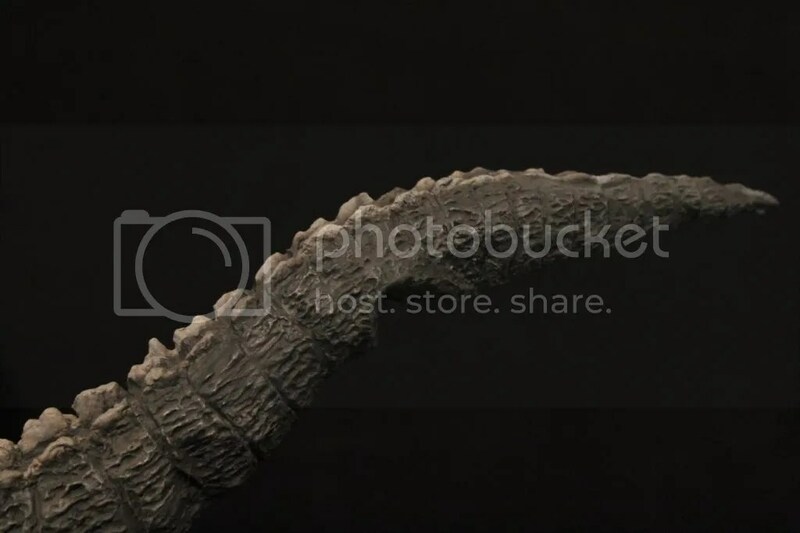 That goofy look that we see in the film is simply captured within this figure! 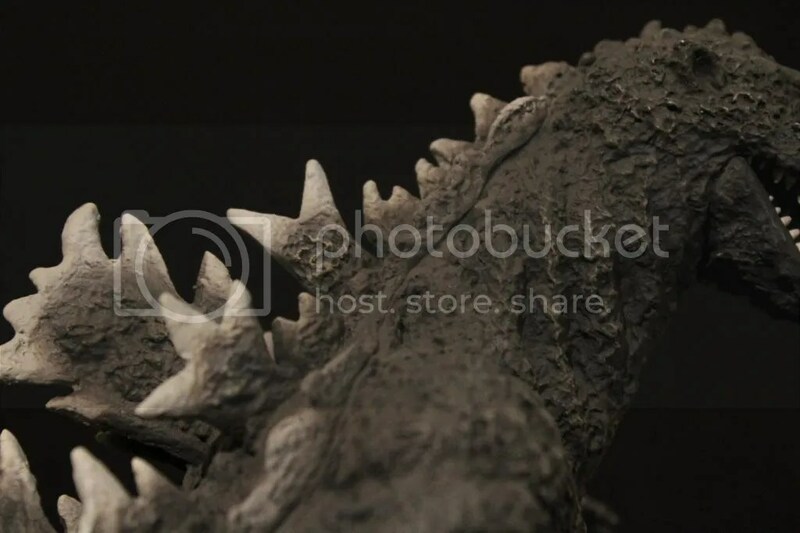 Godzilla’s tree bark skin is captured very accurately as well. The skin is rough and jagged in places. 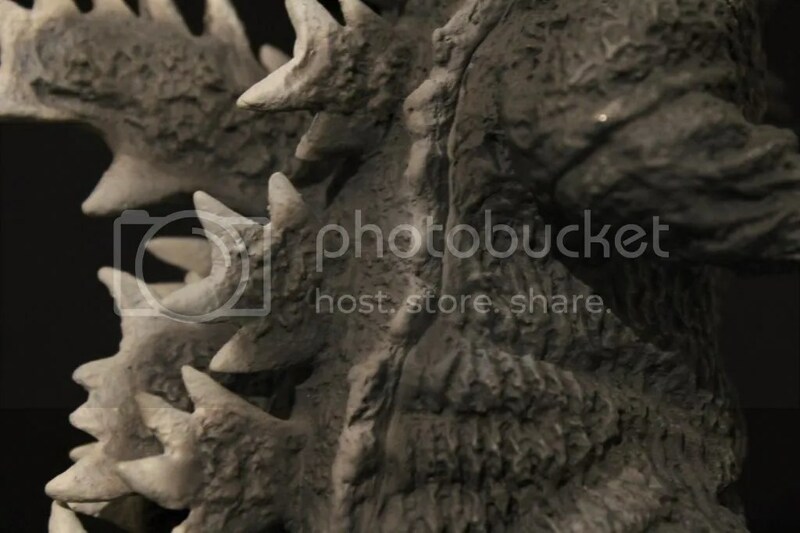 I also love how the paint job is complimented by dry brushing in certain areas to accent the black and white tones. Below, the legs can be seen replicating the bagginess that the suit carried. There are suit sags in the stomach and leg areas below the knees. Very FRESH looking! A seam can be seen where the tail connected to the hole on the body. Another seam about 1/4 of the way down the tail can also be seen. These seams are not distracting at all as they are hidden well by the dorsal plates. 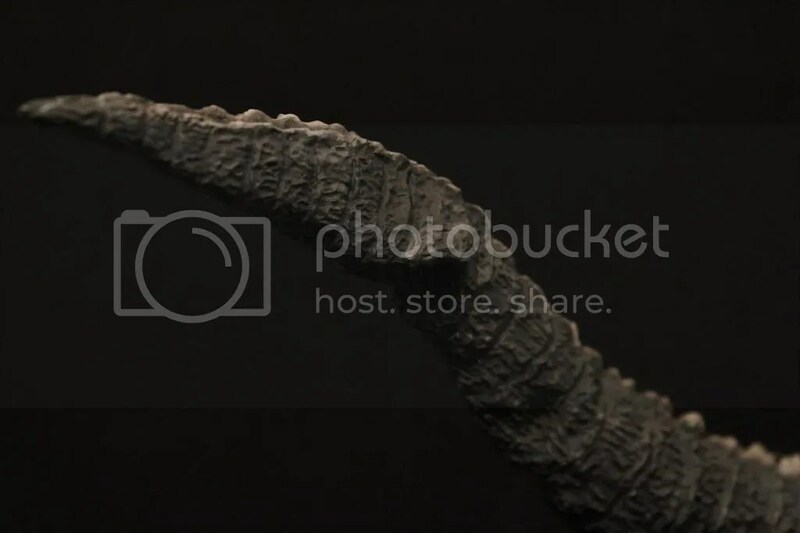 Looking at the tail below, the tip of the tail dips a bit. 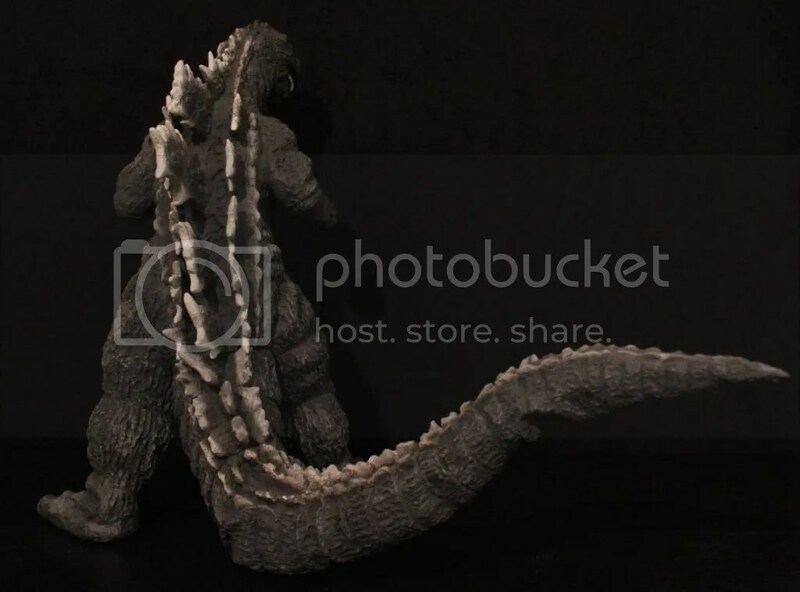 I am speculating that dip and curl in the tail is from where the wire was placed to help swing Godzilla’s tail around while filming. Regardless, I love how X-Plus has went to lengths to capture all the small details throughout this figure. 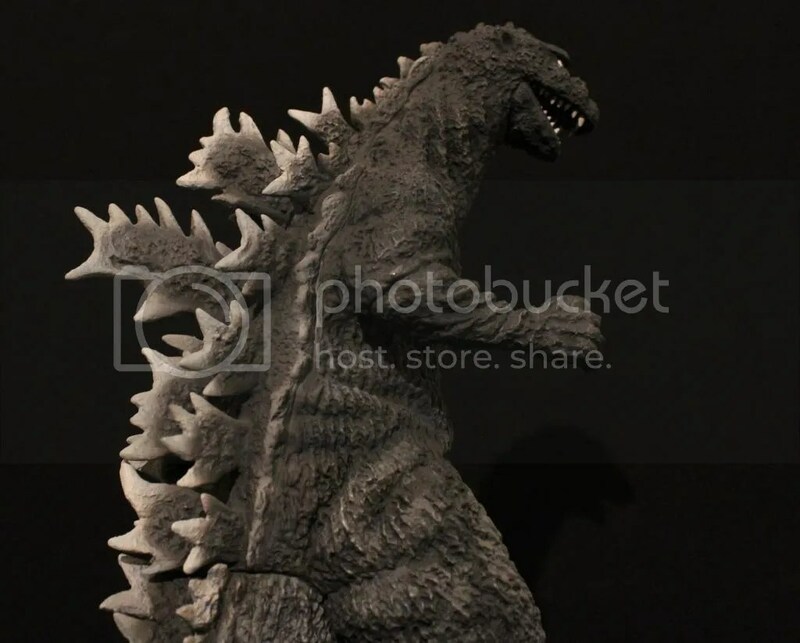 Another wonderful addition to the sculpt and detail is the seam that runs down Godzill’a back on the right side. Look closely and you can see the seam that starts at the head and works its way down to the tail. 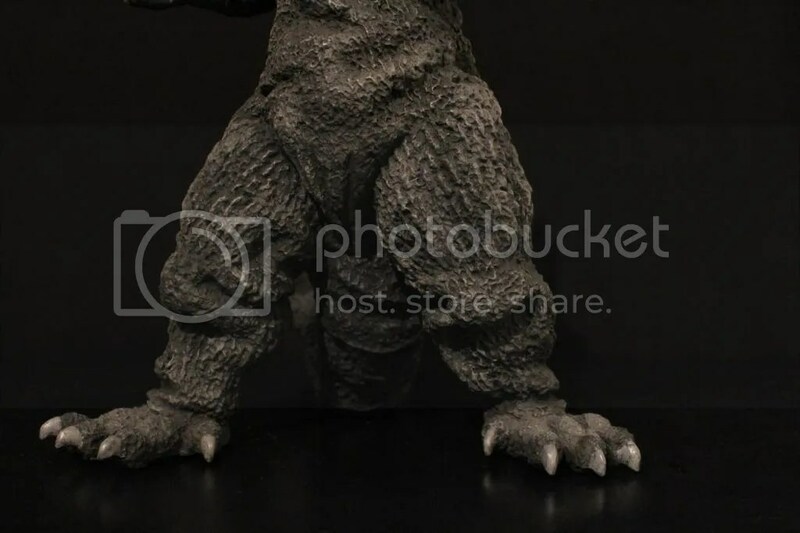 That seam replicates where Haruo Nakajima entered and exited the Godzilla suit. I love how this is easily seen and reproduced on a figure in this scale. You will only get this type of attention to detail with an X-Plus figure. It looks great!